His strategy involves first mapping out and analysing the logical boundaries and ontological structures of the aesthetic domain. 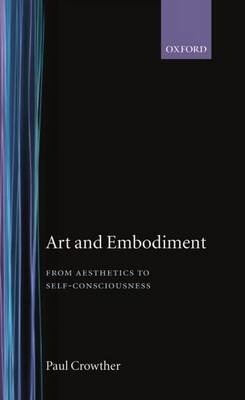 He then considers key concepts from this analysis in the light of a tradition in Continental philosophy (notably the work of Kant, Heidegger, Merleau-Ponty, and Hegel) which-by virtue of the philosophical significance that it assigns to art-significantly anticipates the ecological conception. On this basis Dr Crowther is able to give a full formulation of his ecological definition. Art, in making sensible or imaginative material into symbolic form, harmonizes and conserves what is unique and what is general in human experience. The aesthetic domain answers basic needs intrinsic to self-consciousness itself, and art is the highest realization of such needs. In the creation and reception of art the embodied subject is fully at home with his or her environment. Introduction - an ecological theory of art. Part 1 Varieties and structures of aesthetic experience: the aesthetic domain - a logical geography; aesthetic experience and the experience of art; alienation and disalienation in abstract art. Part 2 The philosophical significance of art: fundamental ontology and transcendent beauty - an approach to Kant's aesthetics; Heidegger and the question of aesthetics; Merleau-Ponty - vision and painting; art, architecture and self-consciousness - an exploration of Hegel's aesthetics. Part 3 The ecological significance of art: the needs of self-consciousness - from aesthetic experience to unalienated artifice; art and the needs of self-consciousness; defining art - questions of creativity and originality.